Pat and Karen The Orchard Youth Club, Slough, March 1981. Photo by Anita Corbin. When Anita Corbin first exhibited Visible Girls back in 1981, it struck a chord with young women across the UK. In an era when teenagers and twenty-somethings were breaking away from convention and exploring bold new styles, these impassioned portraits captured the excitement and dazzling creativity emerging from every street and suburb. While the original twenty-eight images focused on the tribal environments and die-hard devotion unique to subcultures, Visible Girls: Revisited goes a step further by adding a series of recently commissioned portraits, many of the same women. This juxtaposition of past and present day and youthful rebelliousness with later stability, grants the portraits a depth beyond that of mere fashion trial-and-error. 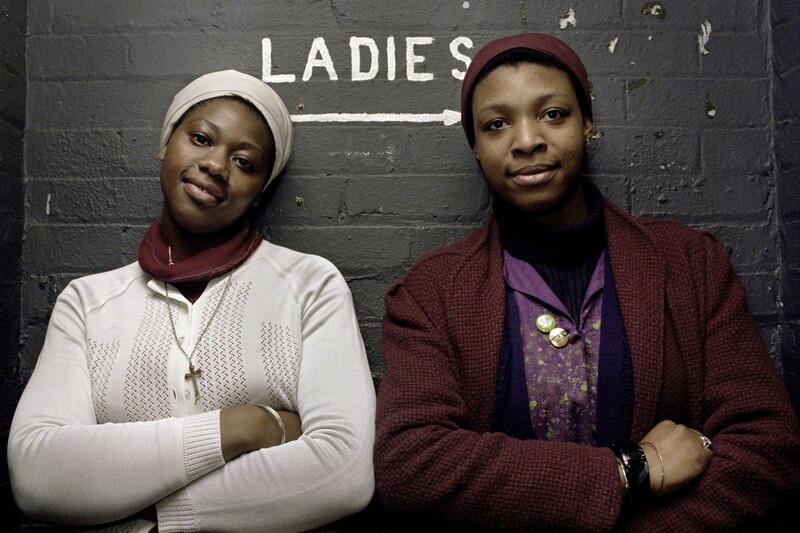 Carrie Kirkpatrick (left) and Gill Soper outside the toilets in Crystal Palace, London in November 1980. Photo by Anita Corbin. Even so, the photographs are an incredible capsule of trends. What is immediately striking about the portraits is how distinct each style is from the next. There are girls in blazers and bowler hats, girls in lurid jumpsuits, girls in fringed coats and shaggy haircuts, girls in metallic eye-shadow and tattoos, girls in leather jackets and miniskirts. Many are stiff and unsmiling; others seem more candid. The only crossover is that each image features two friends. This mirrored composition invites the viewer to speculate on the relationship between the subjects, and the conversations or incidents which may have led to each specific look; the records played on rotation or the wardrobes spilled out in 1980s bedrooms as each set of girls carefully carve out their own very specific visual identity. Another interviewee describes her habit of walking around Kings Road stalls, not to buy clothes – a pair of jeans could amount to a ‘whole year’s spending’ – but to glean inspiration for outfits she’d later put together from scratch, whether these entailed fishnet stockings or a crash helmet. The candour and ingenuity of Corbin’s youthful subjects is endearing, and her modern portraits exude much of that same warmth. Inevitably, many of these have more domestic settings and are populated by cocker spaniels rather than fishnet stockings. Nevertheless, it isn’t the abundant hairspray or unorthodox colour palettes which mark the girls in the original series ‘visible’. Rather it’s the confidence embodied by the friendships, the seemingly ‘us versus the world’ mentality which perhaps sparked off their fashion leanings in the first place. 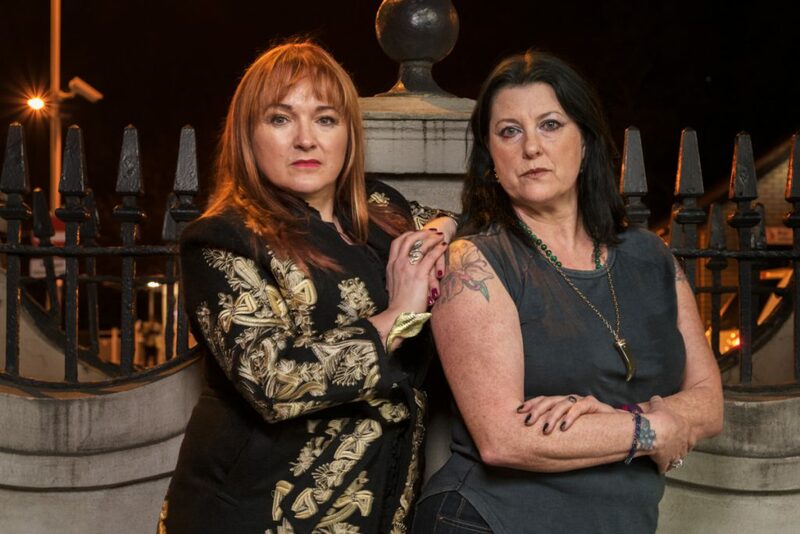 Carrie Kirkpatrick (left) and Gill Soper outside the toilets in Crystal Palace, London in April 2017. Photo by Anita Corbin. The exhibition notes highlight the shifting nature of underground cultures, noting that while the need to construct one’s identity is still integral, modern teenagers ‘can do it all from a smartphone.’ Today’s youth, of course, can cultivate a style and showcase it for their online audience without skipping a beat. Conversely, Corbin’s subjects don’t demand affirmation, they almost seem to resist it: theirs is a private universe which even the photographer has to coax her way into. It’s this hard-won individual aesthetic which makes Visible Girls such a compelling document, not only of teenage fashion, but of the enduring bonds of friendship at its core. Anita Corbin: Visible Girls Revisited, Artlink, Hull, 7 July 2017 – 11 August 2017. Read more about the project on visiblegirls.com and support it here. Orla Foster is a writer based in Sheffield.